I love cake as much as the next woman: big cakes, little cakes, chocolate cakes, coffee cakes, cream cakes, fairy cakes and even carrot cakes. There’s been an awful lot of cake shared on this blog over the last 4 years. 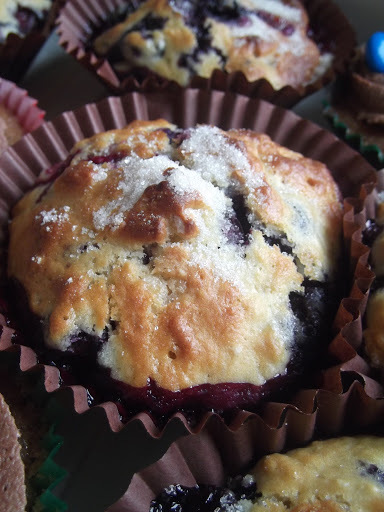 But now I turn my attention to something a little different – Blueberry and Lemon Curd Muffins. I was surprised myself when I was going back over my posts and I noticed that I did not have a basic muffin recipe! In the past I had posted a recipe for cheese muffins but I don’t have a chocolate or blueberry muffin recipe on here! I really do surprise myself sometimes. Although this isn’t your classic muffin recipe, it is more of an American-style blueberry muffin recipe just with a little twist! This Blueberry and Lemon Curd Muffin is soft and bouncy, with the sweet syrupy goodness of a big fat blueberries bursting in each mouthful. At the centre however is a zingy surprise – a gooey blob of sharp lemon curd to cut through the sugar in the rest of the muffin. There are many ways you can fill a cupcake or a muffin. You can treat them like a little sandwich cake cutting them in half before spreading your filling between the two, or you can bitterly them as I did with my gooseberry and elderflower cakes, but if you want your filling to be a real surprise then this method is the way for you! Where you see a crack in the muffin top, simply use a narrow nozzled icing bag full of your filling to squeeze it inside! You will see the muffin begin to swell then stop piping before it all squirts out! This is known as bismark filling! I love seeing people’s faces when they bite into a cupcake or muffin that has been filled in this way! The bigger the muffin, the more of a filling you will be able to get in! This recipe will make 12 small muffins or 8 medium sized muffins! Double the recipe for extra large muffins! Pre-heat the oven to 200C / gas mark 6. Sift together the dry ingredients in a large bowl. Add in the wet ingredients and stir no more than 15 times! The mix is meant to be lumpy, in some ways the lumpier the better. Mix in the blueberries and then spoon into your muffin cases. Bake for 15 or until golden! Allow to cool before filling an icing bag, fitted with a bismark nozzle, with the lemon curd. Squeeze lemon curd into each muffin until all the lemon curd has been used.